Property Size 854 sq. ft.
What do you get when you combine unrivaled oceanfront views from a private lanai with gorgeous, high-end interiors? You get Sea Village 4207 and one amazing Hawaiian vacation! Bring your ohana – family – and experience the Big Island of Hawaii. Inside, gorgeous travertine floors flow through the open and airy space. Floor-to-ceiling patio doors and windows bring the amazing ocean views inside the living and dining areas. After a day of exploring, crash on the plush sectional couch, flipping through the channels on the flat-screen TV. The fully-equipped kitchen will bring out the Food Network star in you with its ample prep space on the granite counters and full-size appliances. Even as you cook, you get glimpses of the Pacific across the kitchen island. Retreat to the master bedroom, featuring a king bed, built-in exotic wood dresser and flat-screen TV. The master bathroom has a brand new walk-in shower, as well as granite vanity with black sink. 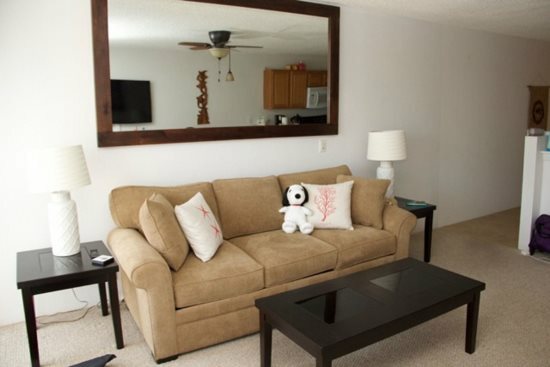 Guests in the 2nd bedroom get a cozy queen bed, built-in wood dresser, mirrored closet doors and flat-screen TV. The high-end touches continue in the guest bath too, with a new tiled shower and granite vanity with black bowl sink. 1. Oceanfront Views for Miles: Sit out on the lanai and watch the cruise ships sail by, waving as you sip on a cold drink. 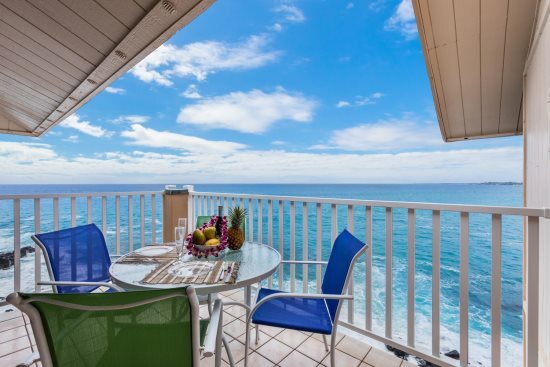 The lanai has a 4-person patio table so you can dine al fresco with the blue waters as your background. 2. On-Site Activities: Spend your afternoons lounging around and playing in the unique-shaped pool, set right on the Pacific. At the end of the day, relax in the hot tub overlooking the ocean. The complex also has tennis courts, grassy area for BBQs and picnics, and an on-site café. 3. 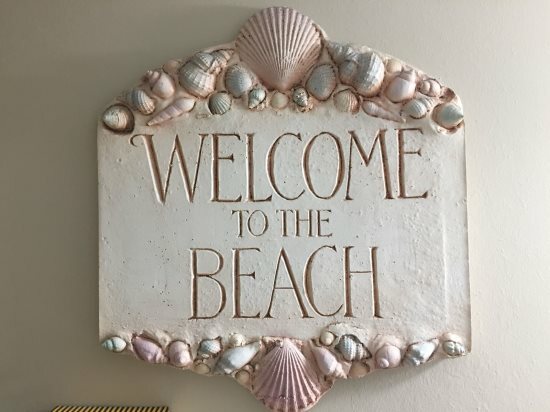 Lots of Amenities: You’ll feel right at home thanks to amenities like Wi-Fi, washer and dryer in the condo and all linens and beach towels provided. You’ll also get a starter kit of paper and cleaning products. When you need a little pick-me-up, walk over to the Green Flash café for a cup of coffee, a yummy pastry or a scoop of ice cream. Numerous quaint shops and delicious restaurants are less than a mile away when the cook takes the night off. 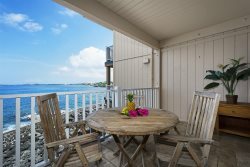 Thanks to its central location in the town of Kona on the Big Island, the condo is the perfect home base to explore the island. Check out the Kona Hawaii Seahorse Tours near the Kona airport, where you get to learn about these fascinating creatures and even hold one. You also can’t miss the Star of the Sea Painted Church in Kalapana and the Kona Farmer’s Market, open daily. 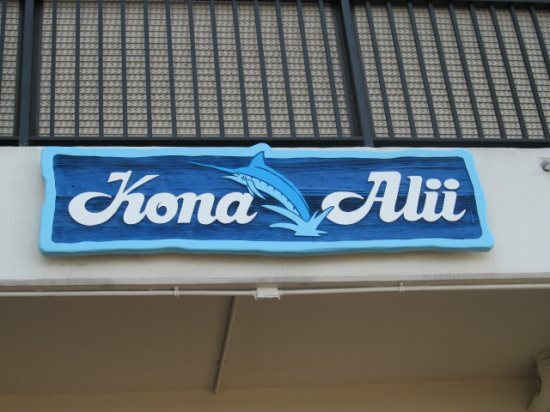 Located in Kailua-Kona on The Big Island of Hawaii. Located in building 4 on the 2nd floor (no elevator).